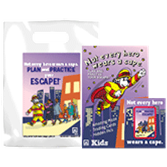 Get kids excited about Fire Prevention Week™ learning with the Community Outreach for Kids Package. Use the Community Outreach for Kids Package to make your event even more memorable and effective, or use it to introduce and promote the free Learn Not to Burn® program (sparkyschoolhouse.org) from NFPA®. Fire Prevention Week is your opportunity to introduce and enforce fire-safety and lifesaving techniques to the younger members of your community. Order Community Outreach for Kids Packages to use during Fire Prevention Week and at gatherings and events all year long!